"I wanted the girls to be costumed brightly without hiding their movement under baggier clothing. The unitards worked perfectly! We added ruffles to the wrists and neckline using fabric from a few extra unitards and attached good old pom poms to the front." 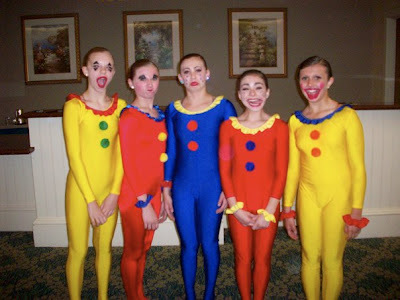 These awesome dancers are wearing their We Love Colors solid color unitards in yellow, rust, and royal.